New Perspective Senior Living has a goal to serve 10,000 older adults by 2025, up from the roughly 2,200 residents it currently has. To help hit that milestone, the Eden Prairie, Minnesota-based developer, owner and operator has expanded its senior housing pipeline to hold as many as three to five new construction projects a year, along with some acquisitions. Currently, New Perspective has 22 communities spread across Minnesota, North Dakota, Wisconsin and Illinois. And that could be just the beginning of growth for the senior living provider. New Perspective’s communities typically span three to four stories and have between 130 to 150 units for independent living, assisted living and memory care residents. The company’s operating focus falls somewhere between hospitality and health care, with a model that includes four wellness pillars: physical fitness, brain fitness, dining and nutrition and social/spiritual enrichment. Developments currently in the works include New Perspective Franklin, a 149-unit community in Franklin, Wisconsin, and New Perspective Waukesha, a 128-unit community in nearby Waukesha. Both buildings will come with a range of amenities including multiple dining venues, an indoor heated pool, beauty salon and spa, activity center, movie theater and dance hall. New Perspective also in February announced its acquisition of New Perspective Carlson Parkway, a 122-unit assisted living and memory care community in Minnetonka, Minnesota, that was formerly managed by Brookdale Senior Living (NYSE: BKD). 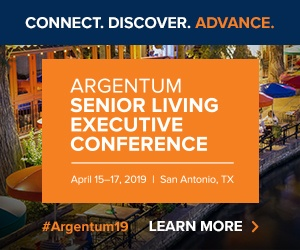 The senior living provider considers its core markets to be those within the “central U.S. corridor” according to Chris Hyatt, partner and COO at New Perspective. That might include new openings in North and South Dakota, Colorado, Texas, Indiana, Ohio, Pennsylvania, Tennessee, Kentucky and — while not in the central U.S. corridor — Florida. The company has ramped up its hiring and HR efforts in order to help bolster its workforce as it grows. It also recently reviewed or rewrote all of its policies, procedures, forms, playbooks and operating manuals in order to create a common framework for employees and communities to follow as they join the company. Hyatt is among the relative newcomers to the company. He joined in 2017, having previously held leadership positions with Emeritus Corp. and Brookdale. On the technology side, New Perspective has looked to standardized systems and processes in order to scale more effectively. Current partner vendors include OnShift, Eldermark and It’s Never 2 Late (iN2L). Similarly, New Perspective has also standardized some of its relationships with other kinds of vendors, such as those that offer pharmacy, therapy, elevators, trash removal, food, fire protection, pest control, building systems and emergency response services.